Venus de Milo isn't the only star article → Find more of them! The Venus de Milo is an ancient Greek marble statue that stands 203 cm (6 ft 8 in) tall. The statue was discovered on the Greek island of Milos in the Aegean Sea in 1820, and later presented to The Louvre in Paris, France where it is now displayed. In ancient Rome, Venus was the goddess of love and beauty. In ancient Greece, Aphrodite was the goddess of love and beauty. Because this statue is of Greek origin, it is sometimes called Aphrodite of Milos. The Venus de Milo was sculpted sometime between 130 and 100 BC by Alexandros of Antioch. His name was inscribed on the original base of the statue. This base was lost shortly after the statue's discovery. The statue was discovered on 8 April 1820 by a farmer on the island of Milos in the Aegean Sea. French naval officers in the area recognized its value at once. At that time, Milos was part of the Ottoman Empire. The French Ambassador to Turkey negotiated the purchase of the statue for France. It was presented to King Louis XVIII of France in 1821. The king presented the statue to The Louvre in Paris, where it is on permanent display. The statue may have been part of a large group depicting The Judgment of Paris. The statue once held an apple in her left hand. Fragments of the upper left arm and hand were found at the time of discovery. The right arm and hand are lost. It is not known how, when, or where the arms were lost. In 1939, the Venus de Milo as well as the Winged Victory of Samothrace, and Michelangelo's Dying Slave and Rebellious Slave were removed to the Château de Valençay in the French countryside for safekeeping as World War II approached. 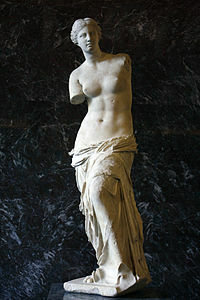 Sometimes the Venus de Milo is featured in songs, novels, satires, and movies. The statue can be seen in the Walt Disney movie Hercules, for example. In this movie, Hercules accidentally breaks off the statue's arms while skipping a rock on the water. This page was last edited on 1 April 2015, at 15:23.